Treating depression can be tough. Your client is struggling desperately through their life, hour by agonising hour. As a practitioner, you understand how they feel and you desperately want to help them. It can feel like you’re caught in a crushing vice between their pain and your own empathy. Depression warps people’s world view, and the natural response to that is to unload all that pain. On you. Their depressed world view rains down on you, waterlogging your most upbeat efforts and dampening your therapeutic spirits. Now of course we’re trained to deal with this, but even the most experienced practitioner can find it hard to resist the onslaught of depressive thoughts and life-sapping perspectives that come forth from the depressed mind. At first, you manage to remain positive and maybe even get some gains with your depressed client, but soon enough, you find yourself floundering in a seemingly endless sea of impossible-to-solve problems. Worst of all, you might find yourself becoming a little depressed too. And that’s no help to anyone. A clear understanding of what is happening with a depressed person. In other words, why they are depressed. A simple framework for treatment that will keep you on track and protect you from the overwhelming detail and depressive perspectives that the depressed client often swamps you with. New knowledge: Depressed people need a clear, easy-to-understand model of how depression works and why it is so awful. We call this the cycle of depression. We teach it to clients in the very first session and it almost always blows them away. I’ve seen depressed people laugh out loud with joy at the release this gives them, when they understand how simple and normal depression is. I’ll show you exactly how to do this on the course. A break from the stress: Depression is always accompanied by anxiety and this drives depressive symptoms and creates a highly stressed brain. Without relieving this stress, little progress can be made. You’ll discover how to do this quickly and easily, and give them the tools to do the same. They need all this (and more) embedded in a setting of calm understanding from a practitioner who knows that they can help. This sense of confidence alone can do so much for someone who has given up hope of ever feeling well again. Well, because in my 20+ years of training therapists, I have seen again and again just how many people fail to get the help they need, when they need it, with disastrous consequences. I have seen caring, capable therapists give up their practices because they weren’t making the difference they had hoped, or just couldn’t make ends meet. It’s not easy being a lone practitioner. Trying to stay in touch with the reasons you first started helping others is difficult while dealing with the day to day pressures of marketing, running your business, and the isolation that can bring. I know because I’ve been there. For years I had the long hard slog of trying to build up my practice. And that slog was made all the harder by the depressed clients I was seeing who I knew I could do more for. And my word of mouth referrals just took off. For a long time I wondered why. Why should it make such a difference when I helped depressed people, compared to all the other problems I treated? Then I realised: Because no-one else could do it. Or at least, very few people could. And doctors had been seeing these poor people for years – coming back to their surgeries again and again, and they felt just as helpless as the patients themselves. If you’ve seen the videos I sent you over the last week or so, you’ve heard a lot about this approach. And it might seem complicated, but I promise you it’s not. In fact, complication is the last thing a depressed person needs. They are already confused and scared about what is happening to them. After learning this approach (more years ago than I care to remember! ), I started training therapists in it with my company Uncommon Knowledge. We did this for ten years on our year long practitioner diploma course. Hundreds of therapists from that course are now making a real difference to thousands of depressed people’s lives. Then in 2007 we put How to Lift Depression Fast online, and continued the training to practitioners worldwide, all the time refining and improving the training material to make it simpler and easier to use. Since that time, thousands of practitioners have taken this course (you’ll see some of their testimonials further down the page). We put it into home study format in a book and digital pack, and finally we have created this format – home study materials in a lovely online space called Uncommon U which we created specifically to make online learning easy and enjoyable. Throughout the course you’ll be able to converse with your fellow students, discuss cases with them or myself, review and repeat any material as you feel necessary, and ask questions in the comments section in Uncommon U or save them up for the monthly live Q&A calls. When I’m talking about this course, I find it hard to get across just how much I believe in it without shouting and waving my arms around. And I believe that once you’ve completed the course, you’ll feel exactly the same. There’s nothing like the feeling you get from truly helping a depressed person to get you all worked up! And you are the judge. If you don’t agree this is the case, simply ask and I’ll refund you. You see, I really want as many practitioners to know this approach as possible. What’s included in the ‘How To Lift Depression Fast’ course? Comprehensive course notes – 123 pages in book format, sent to you by post if you buy the Digital & Physical option and also available as a PDF online. Course materials on CD – sent with your course notes book if you chose the Digital & Physical option, this CD contains all the audio and PDF versions of the written materials from the course. Depression Treatment Video – watch me treat a depressed man using the Uncommon approach. Client Audio Sessions – be a fly on the wall, listening to 3 live therapy sessions with myself. You’ll see all the techniques come together. Monthly Live Question & Answer Session – join your fellow students from this and our other courses to ask me questions about the course and any therapy-related queries you have. You can ask your questions live on the call or submit them beforehand and if you can’t make the live calls, they’ll be available to download the following day (in mp3 format). 4 Free ‘Peaceful Moments’ relaxation downloads (value $35) – you can copy these onto CD or USB stick for your clients, available online or on your course materials CD as mp3 downloads. Full access to the archive of previous live interactions between myself and previous students on treating depression. That’s more than 10 hours of detailed discussion on topics such as interventions for specific clients therapists are working with, comment on approaches and depression treatment ideas not in our course, and more. Access to our online training platform, Uncommon U with private comments areas where you can discuss the course, clients, ideas and ask questions with me and other course students. 2 video assignment sessions – videos from myself on key topics, with supporting materials to embed your learning. Dedicated course support – Kirstin, head of our Uncommon Care Team, will be on hand to answer any queries you might have, either in Uncommon U, by email or by telephone. Certificate of completion – on successful completion of the course, you will receive a personalized certificate. Confirmation of 21 hours/points for your Continuing Professional Development. ‘The Natural Depression Treatment Program‘ (value $195) a self-help program for depression sufferers and includes 17 deeply relaxing audio sessions and a 200-page workbook (all as downloads). ‘The Learning Path’ eBook – a 100 page eBook that you can print and share with your clients, to help them understand how depression works and how to beat it. Reframing Training CD (value $60) containing role plays on how to change depressed people’s minds about themselves (a tricky skill we think you’ll agree!) Available to download if you choose the Digital Only version. Well we’re here to help. We know how difficult marketing can be. According to the surveys we’ve done and the discussions we’ve had with our therapist friends, that’s one area that people said they had particular trouble with. We’ve heard time and time again that they’d prefer to focus on their clients, not on continually drumming up business. But once you get the resources you need from the Client Attractor Pack, you’ll be able to boost the numbers of clients coming through your door. You get immediate access so you can take the course at your own pace and you have access for one year. I looked forward to each Session and find I’m able to use the material in my practice daily. The course has been an invaluable addition to me as a practitioner – filling gaps in my knowledge (lots of ‘yes, that makes sense!’ moments), providing an evidence-based framework for treatment, and sparking the enthusiasm to take it out there and make a real difference. Mark and Roger have done a very good job indeed – as have the many of you involved in the course production and delivery. – Emma Hockley, Counsellor of Psychological Support & Interventions, New Zealand. Her doctor took her off blood pressure tablets after two weeks as she didn’t need to be on medication as it had reduced to normal! She found hard to as she was so attached to the medication she had taken for over 40 years and did a little reframing and she seems to be ok. She has returned to her home town where she lives so she only had two sessions. Interestingly, this darling woman did not want to be hypnotised at all, so we just labelled it ‘relaxation’ and she was ok with that. There’s always a way to get around those pre-conceived myths! :-) I also gave her one of my own recorded hypnosis MP3s and some relaxation tracks. This helped her a lot. I doubt whether she has filled in her goal setting sheets (basic needs); however, she started addressing those needs that weren’t being met in her own way. I have used other parts of the program for other issues to help with goal setting – primal human needs etc, self talk, explanatory styles etc. I loved this course and learnt a lot! – Annie Walker, Clinical Hypnotherapist and NLP Practitioner, Bathurst Hypnotherapy, Bathurst NSW, Australia. I just would like to thank you for the Lift Depression course I’ve just successfully completed. I enjoyed the structure immensely and liked the way it built in detail and complexity as the different modules were revealed, that and how the quiz at the end of each section carried questions on from previous sections. A very accessible course, with lots of information we can work through in our own time. I particularly liked the practical exercises, which have helped me deal with my own anxiety and depression. I feel like I have ‘walked the talk’ and can now move on to help others. The self-hypnosis MP3s are truly excellent and of a massive help in my daily life (I use them daily). Very supportive course and community, thank you. :) – Kitty Schwichiski, Trainee Psychotherapist/Clinical Hypnotherapist, UK. I have found your course exceptionally good. I have undertaken a number of different trainings and feel I have a good toolkit (NLP, Hypnosis, CBT, SFT, EFT) and what I have really found useful with your depression course is that it has provided me with a really great structure and greater confidence and clarity in pulling it all together. Thanks for the course – it is really making a difference! – Sarah Humphrey, Occupational Therapist, Newcastle, UK. In comparison to the current view of mainstream medicine this approach to depression is much more sound and convincing to me. – Dr Peter Ulle, Dentist, Graz, Austria. The course content is excellent. Everything is brought together in a clear and immediately applicable format. Understanding the Cycle of Depression is important for any hypnotherapist and I continue to find some of the key concepts essential, not only in working with my clients with depression but also in other areas such as anxiety, panic and migraine. A vital component of any therapist’s toolkit! – Sophie Nicholls, Hypnotherapist, York, UK. What I particularly liked was the availability of the recordings so I could listen and re-listen as often as I wished, gleaning more from them each time. I also thought that the support material was of a very high standard, broadening and consolidating the learning from the calls. I found the content to be invaluable. It gave me a fresh perspective on depression and tools I can use with confidence with my clients. Thank you. – Maria Doherty, Psychotherapist and Life Coach, South Lanarkshire, Scotland. [The Trainers] were wonderful of course, and professional and approachable at the same time–tricky combination as I’m sure you know! I learned so much and I hardly noticed. Thanks for so many skills and techniques and ideas. Best of luck to all at Uncommon Knowledge–I will spread the word as much as I am able! – Bill Frazier, Hypnotic Skills for Positive Change, Maryland, USA. I liked the build up of the course and the weeks focus, topics and practicality. I liked the interactive parts where [the trainers] got us to “think aloud” – some good ideas came up. The Depression-Program is great resource of knowledge and ideas that I already use with clients with success, so I probably will come back to it for more ideas in the future. All in all it is a great value course and got me to deepen my understanding and show me how much I already know and can use with clients. – Etai Gilad, Amsterdam, Netherlands. I liked the way the ‘Lift Depression Quickly’ course was presented step-by-step with the assessments available to view right from the outset, so that one has a well rounded and big picture view of what is required. It enables one to see where it is going. Thank you, this was a fabulous course and it came just at the right time for me on a personal level because I have had three operations in the last two years to cure cancer, one of which thrust me into a surgically induced menopause and I truly needed (I didn’t think I did at the time) to clear out my mind. This course helped me to rid myself of some of those ‘silly little niggling thoughts’ and I am now not only mentally healthy and balanced but also mentally strong again, which in turn has had a big impact on my physical fitness! THANK YOU for returning me to being MAXINE!! – Maxine Hamilton, Master Practitioner in NLP and Hypnotherapy, Horley, UK. It is hard to be specific as there is such a wealth of great information in this course. I know I will be referring back to it all as standard reference material for a long time to come (maybe forever) as it is all bountifully rich in knowledge and helping tools. 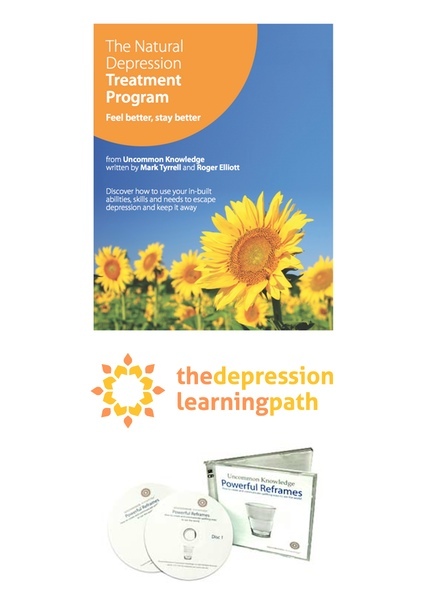 It’s awesome to have The Depression Learning Path and Ebook too. I feel so much wiser for having everything at my fingertips and being able to really get a handle on what depression is and how to help someone in a positive way. Thank-you so much [The Trainers] :-) – Rose Morgan, Hypnotherapist, Christchurch, New Zealand. In this session, we’ll look at some of the reasons for the tenfold increase in depression since World War II. You will learn about the sufferer’s experience, study the ‘cycle of depression’, and see how, in most cases, depression is not due to a chemical imbalance or genetic factors but to anxiety and rumination. You will learn that to be able to lift depression, a therapist needs to help the person to relax and see outside the immediate perceived problems. Spotting unhelpful emotional trance states and changing the client’s focus will help to break the depressed state. You will be able to use the four proven techniques on your client immediately. Calming down your client’s brain will play an important part in their recovery. We are all born into the world with innate needs and if these needs are not met in a healthy way, then our inner drives can force us to pathways of thinking and action that can cause emotional and physical instability. Getting these needs met can be the first steps to problem solving – action, not thinking! Nutrition can be a deciding factor in a depressed person’s recovery; learn how to advise them on how to eat to lift anxiety and bring increased energy. Whether you are with a friend or client, it can often be tempting to try to ‘correct’ what you see as a self-defeating frame of reference as soon as you spot it. But, as with many things, timing and approach are crucial. By reframing your client’s limiting outlook, you can demolish the viewpoint and high emotion that hold their depression and anxiety in place. Helping them to hold multiple interpretations of events and people opens the gate to experiencing life in a more optimistic and comfortable way. When the course is open for booking, choose your preferred course option and enter your payment details. If you choose the Digital & Physical option your course pack will be mailed to you on the next working day. Your log in details will be emailed to you so you’ll get immediate access to the course materials in Uncommon U, including a welcome video from Mark, and access to the comments section where you can introduce yourself to your fellow students. You can begin Session 1 immediately, during which you learn about the Cycle of Depression via your free Depression Learning Path eBook. You listen to the audio lecture for the session and read the materials. You move on to Session 2, after which there is a short test. Once that is complete, you move on to Session 3, and so on through all 7 Sessions. As you go along, you ask any questions you have in the comments boxes you’ll find on every page, or save them up for the monthly live Q&A calls. You continue through the course in this fashion until you have completed all Session tests.